Penn Manor put on a great game as they held off Warwick in overtime. “Feels better than last time,” said Coach Matt Soto. The Comets faced the Warriors three times this season only winning one of the games. Warwick beat Penn Manor for the League Championship just two weeks earlier. 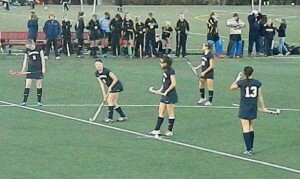 The field hockey team got off to a quick start with Shannon Sloss scoring a goal in the first half. The game was quiet for almost the rest of the game as the teams went back and forth trying to put in rebounds. Then Warwick got a huge goal with two minutes left in the game. The game was sent to overtime with only seven players out on the field compared to eleven in the regular time. This is just what Penn Manor needed to win the game with Eryn McCoy ripping a shot two minutes into overtime for the win. The Comets stormed the field hugging the starters as they now are heading to the District Championship at Milton Hershey. Penn Manor plays Lower Dauphin Saturday at 2:30 p.m. for the district Title.